Landscape lighting and irrigation services have some differences. Electricity and water don’t exactly mix. But contractors who offer these services have a few things in common: They both want to provide customers with the best coverage while conserving resources. That hasn’t changed, although the products for these services have evolved. 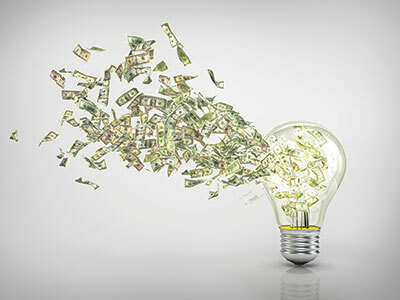 Both are becoming more efficient and tapping into the advances in technology to provide contractors and their customers with better results—whether that’s by reducing water usage or lighting up a home using less wattage. A few lighting and irrigation professionals shared what they’ve seen with product updates and their approach to purchasing these products. Halogen bulbs continue to make their exit from the industry as more professionals turn to LEDs for their lighting services. 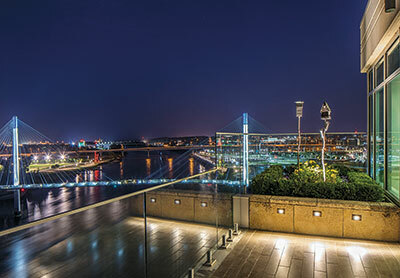 Staying ahead of the curve with lighting can give companies the edge—something that’s important in today’s market, says Andrew Coleman, outdoor lighting designer at McKay Landscape Lighting in Omaha, Neb. The company offers lighting design, installation and maintenance services to about 90 percent residential and 10 percent commercial clients. For the past three years, McKay Landscape Lighting has strictly used LED lights, making the switch from halogen. The company continues to service its existing customers who use halogen, educating them on the benefits of converting to LED. As a company that has provided landscape lighting services for 25 years, the team looks for products it’s proud of to represent the McKay name, Coleman says. The staff wants something that’s reliable and doesn’t burn out prematurely, so it tested LEDs with some willing customers and on their own properties before changing over completely. As part of the education efforts, McKay has invested in professional photography to show clients the before and after shots of halogen versus LED lights, and it’s much brighter. There have even been upgrades from one generation of LED to the next. As LED lights have evolved, some of the fixtures have become smaller and sleeker, allowing Coleman and his team to reach areas, like soffits, they previously couldn’t with LEDs or halogens. “That can make a pretty big impact,” he adds. These fixtures also have grown in capability, with 20-watt LED lights that are now comparable to 120-watt halogen bulbs. The McKay team used them to light up a historic campus building early this year, and it was able to light up four stories with the LEDs. He says it’s important for owners to do their homework when purchasing lighting products. They should focus on developing relationships with suppliers, instead of only looking at the price. McKay is tasked with taking care of its customers, so the team wants a manufacturer who will do the same for them, providing support if there’s a product issue. 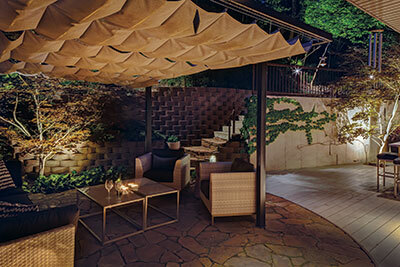 As the desire to create and expand outdoor living spaces continues to grow, so does the need for landscape lighting. Contractors have to find products that will provide both the practical and “wow” factors. And that’s what the team focuses on at Landscape Lighting Pro of Utah. Located in Midvale, Utah, the company provides lighting design, installation and maintenance services to residential customers—in addition to a few light-commercial projects each year. Beyond just the aesthetics, lighting products are also offering refined control options, smartphone app controls and the ability to give clients customization options. Consumers continue to become more tech-savvy and want instant options, and that trend is impacting how they want to interact with their lighting systems. While some of the latest features and technology are catching both his and his customers’ attention, Rosser says the company continues to turn to trusted, consistent options when it comes to product selection. Rosser encourages contractors not to cut corners when purchasing lighting products: “Use products that are going to fit your designs—and not the other way around—know your product’s value and use products that are built for life,” he says. And when looking for a manufacturer, Rosser says his company turns to one that meets its design needs and specifications. The partnership has to be the right fit to be successful. 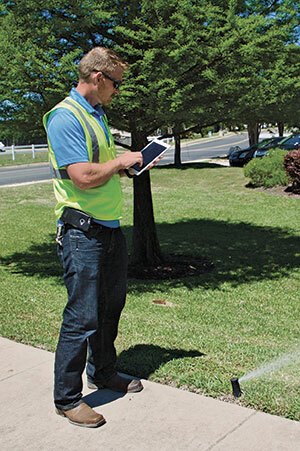 Conservation continues to be a hot topic throughout the irrigation industry, but implementing digital tools is also gaining ground on both commercial and residential properties. Being able to turn systems on/off, adjust programs and troubleshoot diagnostics remotely and in real time with a touch of a screen is the direction products are going. These functions allow contractors to provide a more rapid reaction time to issues and requests from the client, Ball says. Another growing trend in the commercial sector is the growing use of two-wire systems, he adds. They can help make contractors more efficient with their time and resources, adding to their appeal. As for new irrigation products and systems hitting the market, Ball says ones that can be easily programmed to different plant types, elevation changes, soil types and other factors can make a big difference in the quality of the landscape and water conservation. “It’s always exciting to see the technology advances of products growing and making work more efficient and effective,” Ball says. Implementing products that assist with conservation efforts is especially important in areas like where Native Land Design services. With offices around Texas, Native Land Design is accustomed to working with drought conditions and water restrictions. The company provides commercial landscape design, construction, enhancements, maintenance, water management and irrigation services and has an annual revenue of $15 million. When it comes to purchasing irrigation products, Ball says they look for manufacturers with a long history in the industry that are making advances with the product technology. He also prefers working with vendors that have knowledge of the systems and parts he’s purchasing. Although there are regularly new irrigation products and companies, Ball says it’s important to do business with one that’s qualified and available to give advice. Or, “an issue can quickly turn into a nightmare with a suffering landscape and unhappy client,” he adds. It’s important for the manufacturer to have a network of suppliers and regional support technicians for the brands of systems he works with, as well.